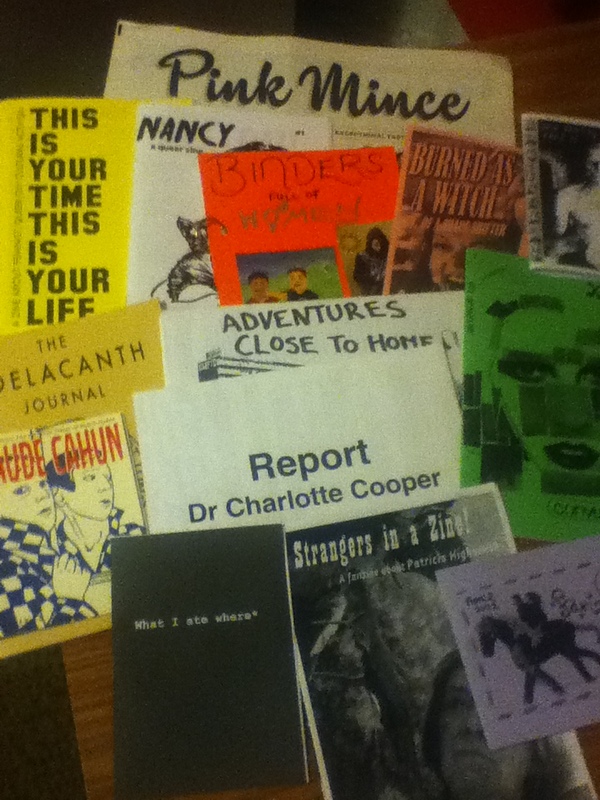 Recent outings: Saturday 8th December was spent visiting the Queer Zine Fest in Kennington. I was surprised that paper fanzines were produced at all in 2012, never mind zines with queer and feminist themes. As I discovered, there’s plenty of people making such zines, and plenty more keen to buy them: there was a healthy amount of attendees at the festival. I wanted to buy and read pretty much all of the zines on display. Even though some of them were quite old – 90s back issues of Girlfrenzy for example – the majority of offerings were written and printed in the last year or two. So I decided to implement a rule: try and buy the latest zine on each stall, until I run out of money. My favourite is probably the Patricia Highsmith zine, Strangers In A Zine, but I also liked the concept behind Binders Full Of Women, a womens’ poetry anthology in the shape of ring binders, each with a different handmade cover. The title was a reference to a rather infamous statement made in October by the Presidential candidate, Mitt Romney. I loved the contrast between this seemingly redundant format of expression – the paper fanzine – and the quotation from the world of 2012 politics. Today: am struggling under a heavy cold that I’ve had on and off for three weeks: possibly two different colds in tandem, if such a thing is possible. The work required for the college course has become particularly intense. I’ve found that as soon I’ve got to grips with the reading for one of the three concurrent modules, I’ve trespassed on the time I should have spent on the reading for the other two. The second year of a course is akin to a Difficult Second Album phase: the novelty has worn off, the freshness has gone, and one is left trying to remember how to do it – whatever ‘it’ is – all over again. In the first year, the course felt more like a single concern that happened to be made up of three modules; now it’s like trying to juggle three demanding projects at once. And then write essays on top of that. I also have a couple of projects that are meant to be my ‘real work’ at the moment: a little book on Polari someone else has asked me to write, and a book I’ve asked myself to write. But time leaks away at the cruellest of speeds whenever one wants more of it. I find I barely have enough time to do the college course. Or at least, do it well. Tuesday 11th December: Along with some fellow students, I attend a production of The Tempest, at the Lion And Unicorn Theatre in Kentish Town. The venue is new to me, despite having lived up the road for eighteen years. It’s certainly invisible from Kentish Town High Street: one has to walk down a quiet residential road and look for a pub, then look inside the pub for a theatre. The company, Grassroots Shakespeare, gets its actors to direct themselves; there’s no single director. This means Prospero seems to be from one imagined production (Northern gangster – a kind of whispering Yorkshire De Niro), Ariel from another (loud, wacky, Batman costume, a bit Jim Carrey), while Miranda could be in a more traditional BBC Shakespeare in the early 80s, and so on. Still, it’s never dull, and when the song Full Fathom Five is followed with a rendition of Lionel Richie’s Three Times A Lady, no one is in the least bit surprised.